Note: I also give this ebook away for free exclusively to subscribers of my newsletter. Do you want to improve your photography skills? Do you want to master different photography techniques by just knowing a few essential and practical tips? 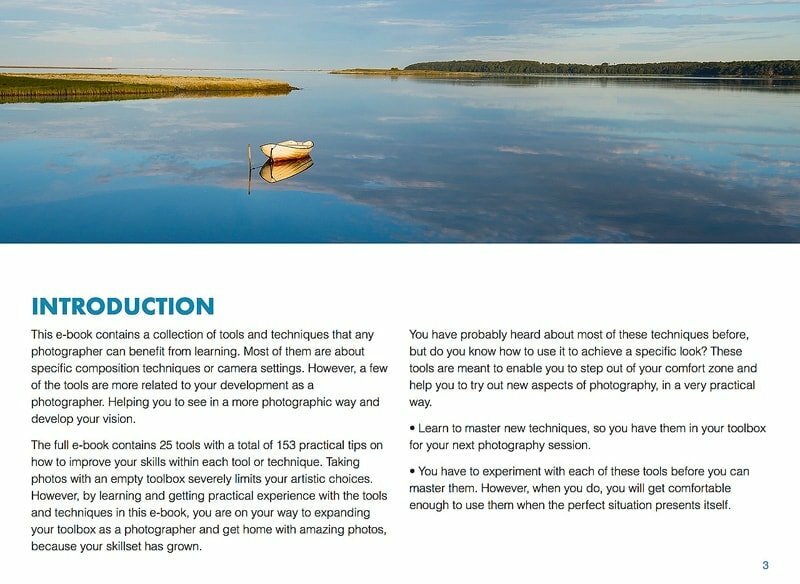 This e-book contains a collection of tools and techniques that any photographer can benefit from learning. Most of them are about specific composition techniques or camera settings bundled together in specific topics, like creating silhouettes, using backlighting, or how to create low key photos (see the full list below). However, a few of the tools are more related to your development as a photographer. Helping you to see in a more photographic way and develop your vision. The full e-book contains 25 tools with a total of 153 practical tips on how to improve your skills within each tool or technique. What Will You Learn In This E-book? Taking photos with an empty toolbox severely limits your artistic choices. However, by learning and getting practical experience with the tools and techniques in this e-book, you are on your way to expanding your toolbox as a photographer and get home with amazing photos, because your skillset has grown. You have probably heard about most of these techniques before, but do you know how to use it to achieve a particular look? These tools are meant to enable you to step out of your comfort zone and help you to try out new aspects of photography, in a very practical way. 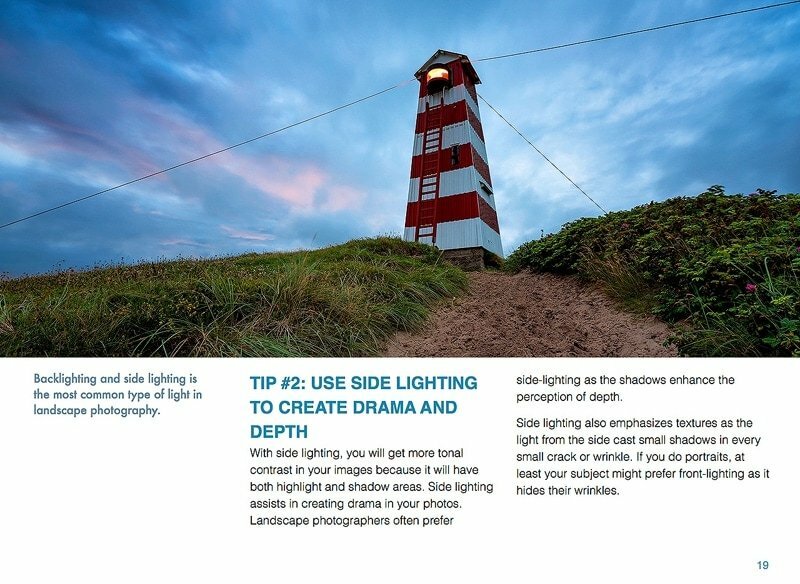 Most of the tips can be combined and thereby opens up to a whole new dimension of creativity in your photography. Learn to master new techniques, so you have them in your toolbox for your next photography session. You have to experiment with each of these tools before you can master them. However, when you do, you will get comfortable enough to use them when the perfect situation presents itself. Because of the practical orientation of this book, you can also use it as a reference or reminder when you need to brush up on a particular technique. The practical tips in this e-book is kept short and precise, ensuring that they are easy for you to put them into practice. Create Movement With Shutter Speed by learning how to use shutter speed, and aperture to use to create artistic movement. How will changing your point of view affect your images? Get tips to go beyond the obvious of shooting from your own eye-level all the time. Get tips on which camera settings that work well to capture panning shots, where the subject is in focus, while the background turns into beautiful streaks of colors. This is a very useful technique master for situations with high movement, like running animals, or people, or fast moving cars, where you want to capture an image a little out of the ordinary. You will get tips on how to aim and focus, and the optimal time to press the camera shutter to capture a shot with a subject in focus and movement in the background. Learning to isolate is crucial to creating stronger photos. You can isolate and exclude elements in several different ways. Which options do you have, and how does it affect your shot. How can you to use natural light to your advantage. How will front lighting affect your image, and what are the benefits to use-lighting? Light is one of the most important elements in any type of photography. Without great light, a photo can only become mediocre. You should learn to understand and look at the light before you’re able to spot great light and thereby use it as a compositional element. You will get simple and practical tips on how to easily to “read” the light in any situation. and create a beautiful light transition effect, where the light shines through a leaf or the petals of a flower. It can be tricky to make this kind of shot. However, the result is incredibly rewarding. 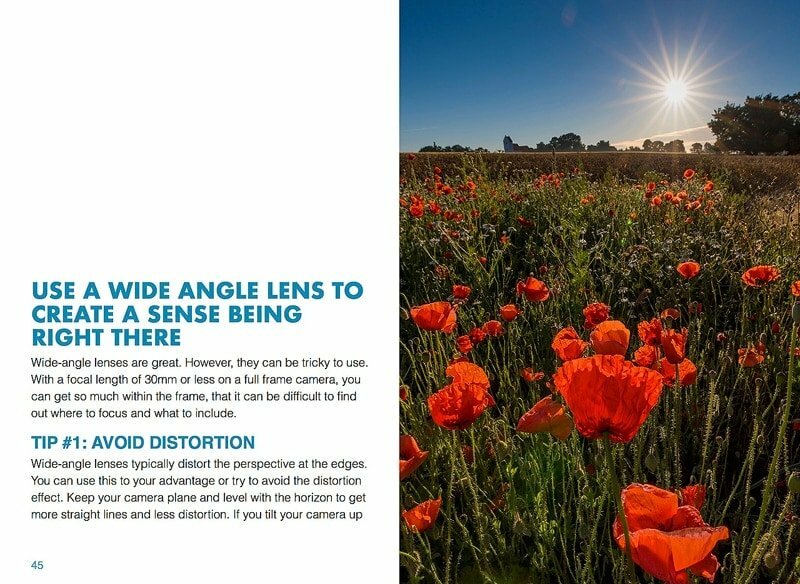 Learn how to position yourself and your subject in relation to the sun, and which camera settings to use for the best result. Using backlight is also a great way to create silhouettes, but it requires completely different settings than for creating transition effects with backlighting. Do you know which settings to use to create a silhouette? Find out where you should stand in relation to your subject and the sun, and which environments make it easier to create beautiful silhouette photos. You will also learn the camera settings, like the optimal metering mode, shutter speed and aperture to create silhouettes. Find out how to create an amazing bokeh effect in your photos? Which aperture and your distance to the subject, is useful and how will your choice in lens affect the look of the bokeh effect? Studying a master’s portfolio can really help you to sharpen your own skills. You can learn a lot about how to read a scene and strengthen your own composition skills, by looking at the work of masters. 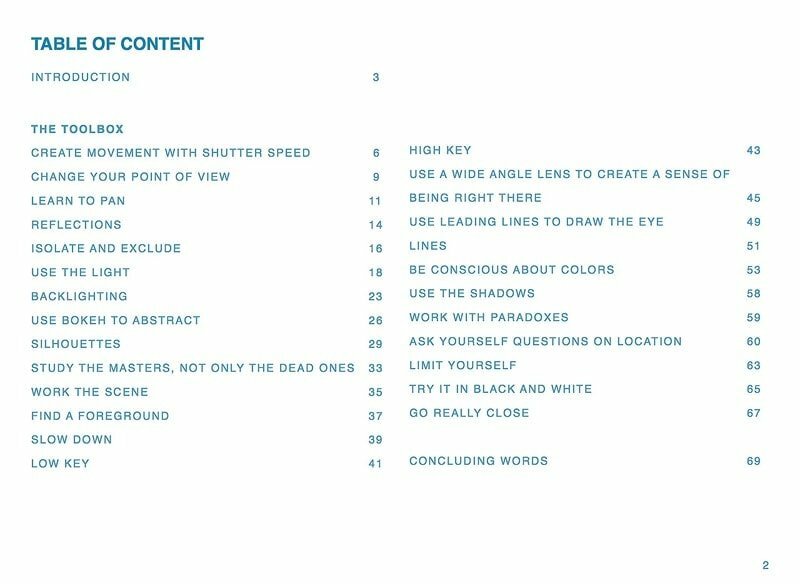 I’ll let you in on one effective way to do it, so you learn the most from analyzing the work of great photographers instead of just looking at their images, without learning from it. Learn how to work a scene, what to avoid, and find a good starting point that lets you explore the subject and helps you find the best compositions at a location. Often the first attempt at capturing a good shot will not be the best. uninspiring. Learn to add depth to your photos and improve them by including a foreground element. Get instructions on what works and what doesn’t work in a foreground, and how you can enhance or minimize the foregrounds role in relation to the rest of the composition. What will happen with your way of shooting, when you learn to slow down before you shoot, sort and edit your shots. Slowing down enables you to connect more with your subject. scale. This gives clean distraction-free and elegant images that allow the viewer to focus the attention on the subject. Learn where to direct the light, and which camera settings that enables you to shot high key photos with confidence. Wide-angle lenses are great. However, they can be tricky to use. With a focal length of 30mm or less on a full frame camera, you can get so much within the frame, that it can be difficult to find out where to focus and what to include. Get tips on how to master a wide-angle lens, and how to avoid the most common pitfalls, when showing with this kind of lens. Learn to create images that give the audience a sense of being right there. Learn to use lines to draw the attention of the viewer towards your subject. When you look at an image, your eyes will automatically follow strong lines. It’s the easy path for the eyes as they travel around the image trying to find out what it is about. Learning how to use lines, where they should enter into the frame, and which kind of mood different types of lines creates in the photo. Most photographers shoot their photos in color. However, most are also unaware of colors and how it affects the image. Colors are as important an element in a photo as texture, lines, form, and composition. Learn how to use colors better in your compositions, and you are on your way to creating more arresting photos that can captivate its audience by its simplicity just because of the colors used. Light is one of the key elements in photography. However, light is nothing without shadows. Shadows play an equal role in making a photo as light does. Get tips on how to get the most of shadows in your photography. Learn to ask questions before you press the shutter to ensure that you get home with the best possible result. Just like having a pre-flight checklist asking yourself the right questions will ensure that your photography session is successful. An excellent way to grow and learn as a photographer is to work with constraints. Why? Because having a constraint you need to follow, forces you to find a way to make things work despite the constraint. Learn how constraints can act as a tool for developing your photography skills. There is a simplicity to black and white photos that I feel no color photo can match. However not every subject will make a great black and white photo. Know the elements needed to create amazing looking black and white photos. Learn the few key elements that make a difference in your black and white photography and you are on the way to develop your black and white photography skills. Learn the tips that make it easy for you to make successful close-up photos. These are some of the things you will learn in this concise, but very practical oriented e-book that helps you to improve your photography skills without overloading you with a lot of technical terms, where you end being more confused and less practical. 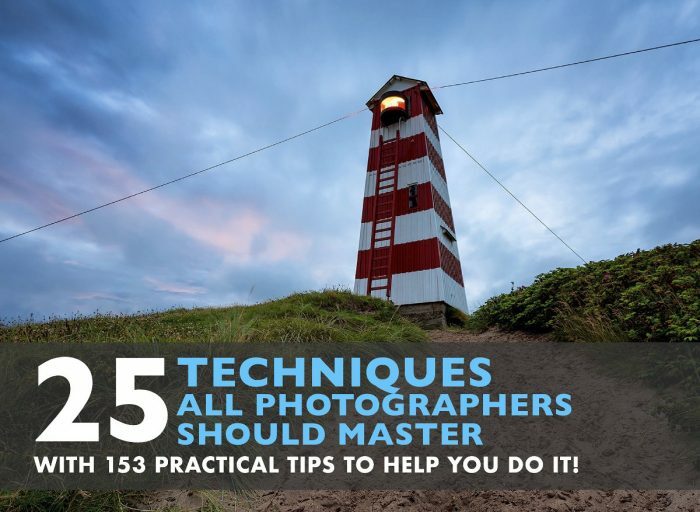 This e-book will enable you to use each technique and if you follow the tips for each section, you will be able to create amazing photos with each technique. Length: 69 beautifully designed pages. Format: downloadable PDF. You can view this eBook using the free Adobe reader software on a tablet or PC. You get an instantly downloadable pdf when you click the Add to Cart button and make your purchase. You can begin reading the ebook The Photographer’s Toolbox, in a matter of minutes. I want you to be happy with your ebook. And I’m confident that you will be, and that it will help you become a better photographer. If, you’re not satisfied with your ebook, please tell me, and I’ll issue a refund for you paid in full, no questions asked.